Chef Edward Lee is experimenting with Asian cuisine in the back bar of Succotash DC. Mr. Lee’s offers a few cocktails, each with a distinct flavor profile and Asia influence. There’s the Brooklyn mule, with Brooklyn gin, ginger, lime, and Shiso, which we wanted to try, but two cocktails just had to come first. 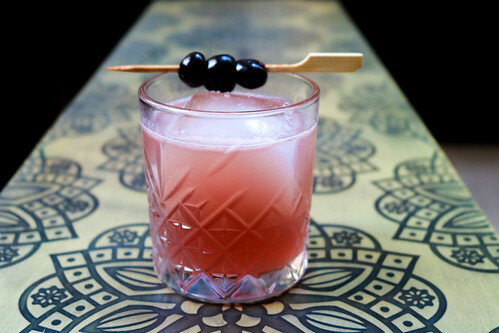 The Red Tokyo is crafted with Sakura-infused sake, luxardo, ginger, and Mr. Lee’s house-made Chinese bitters. It looked a lot like a Manhattan, a dark red cocktail served in a low ball with a big block of ice and Maraschino cherry garnish. 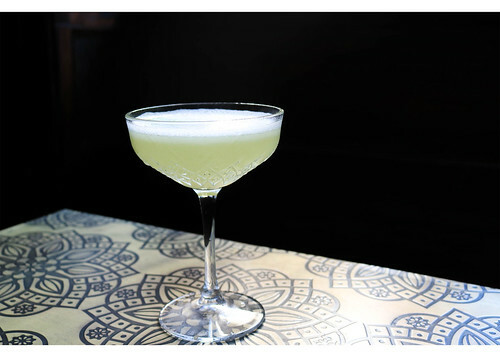 The cocktail was rich, complex, and smooth—it did not taste distinctly like a sake cocktail, as the liquor’s flavor was largely masked by the luxardo maraschino liqueur and the bitters. Meanwhile, the Miss Korea, is comprised of Soju, a Korean clear liquor, with Melon syrup, Yuzu, and egg white. As a result, the cocktail is a light, fluffy, and frothy with a sweet melon flavor. It was a distinctive cocktail—definitely not something you’d have two of but a great pre-dinner aperitif. There’s also a solid selection of wine, sake, and beer, ranging from local beers from Maryland and Washington to Asian lagers like Tiger. We sipped on a Willamette Pinot Noir and a French rosé, both of which were fine, but this is certainly not a wine bar. Mr. Lee’s offers an interesting menu of Asian dishes, including chicken wings, dumplings, a kimchi sampler, and BiBimBap. We chose to share everything, starting with both dumplings—because when it comes to dumplings, you always chose both. While the cool vibes and fun cocktails are a draw, the duck confit dumplings are the primary reason to visit Mr. Lee’s. 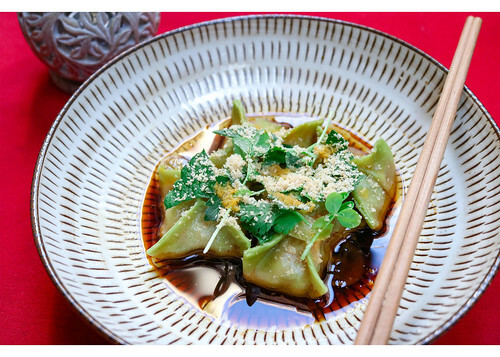 These crispy, classic dumplings are filled with duck confit, snow peas, and Thai basil. There’s only one dessert on the menu: the fortune cookie, and that’s really all you need. This giant fortune cookie doesn’t tell your fortune, but is instead filled with a smooth, creamy green tea mousse. Did we mention the cookie is pink? An enormous, crispy pink fortune cookie is filled with green tea mousse and perched atop fluffy chunks of black sesame angel cake, resulting in a sweetly unique combination of classic Asian flavors for a fun conclusion to a satisfying and shareable meal. Mr. Lee’s pop-up will be open until Saturday, Dec. 22.